When a brand falls out of favor with customers, companies have two choices. They accept defeat, move on and try again with another brand; or they take it on the chin and adopt an exceptional comeback plan. 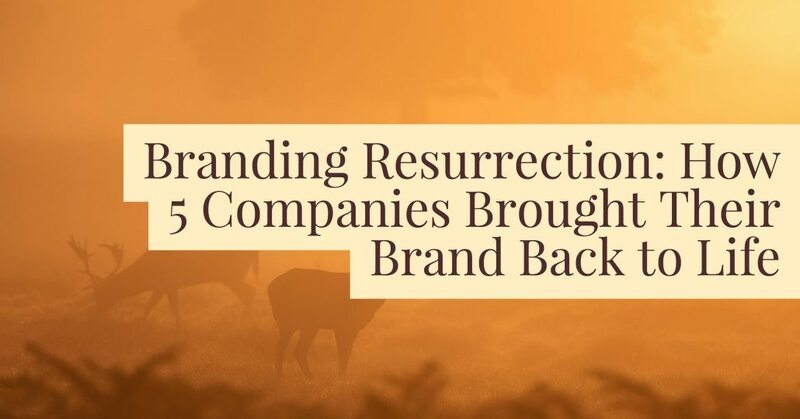 Branding resurrection isn’t a walk in the park but there are some brands out there that’ve made a success of their rebranding – and some of them have become even bigger and better than they were before. New and innovative product designs were introduced by LEGO in the late 90’s, creating thousands of unique pieces that were entirely removed from the classic brick system that LEGO was renowned for. This strategy resulted in a $300 million loss in 2003, followed by a projected loss of $400 million the year after. All of these new pieces they’d designed didn’t appeal to their primary audience – kids. So, to find out where they’d gone wrong they asked kids what they wanted from LEGO, and the answer was simple – they wanted to build. They didn’t want to play with LEGO action figures that had been pre-built (I mean, where’s the fun in that?) so LEGO reverted back to form and the “Imagine” campaign was created. This showed off LEGO’s classic bricks which were casting shadows of more complex objects, reflecting how a child’s imagination works when they play with LEGO. The result? In 2015, LEGO became the second-biggest toy company in the world with $5.2 billion revenue. Despite their popularity in the 80’s, Old Spice started to struggle towards the end of 2000, with new competitor’s Axe taking over a large proportion of their market share. Axe offered a modern and sleek brand whilst Old Spice was outdated and stale (a bit like the men who were wearing it), and the sales reflected this. One particular problem they had was with their deodorant scent “Glacial Falls” which wasn’t performing well. And in order to change this, they enlisted the help of the agency, Wieden + Kennedy. The campaign for Old Spice Swagger commenced in 2008 and included an interactive website, TV ads and print ads. The result? Old Spice quadrupled their sales on an underperforming product – but the resurrection of their brand didn’t just end there. The “Smell Like a Man, Man” campaign was launched in 2010 and their reputation as a modern brand was confirmed with Isaiah Mustafa (a former NFLer) appearing in their ads (this guy definitely wasn’t outdated and stale!). After just six months, Old Spice once again became a category leader with their body wash sales increasing by 27%. The expansion of Starbucks was well under way at the start of the 2000’s both with the products on offer and the number of stores they’d opened. But even though coffee fans flocked to their stores, the quality of service on offer couldn’t keep up with this increased demand. Furthermore, because they’d started to invest in other non-coffee related things, e.g. music, the public started to feel like they were diluting their brand – they’d lost their consistency. When the economic downturn came in 2008, Starbucks started to flounder with many believing that their days were over. But to try and keep their business alive, Starbucks closed over 900 stores, making a huge number of people redundant in the process. With everyone now watching their dollars, turning to cheaper alternatives like McDonald’s, a new game plan was needed. Starbucks needed to convince customers that their coffee was worth paying that little bit extra for. Teaming up with agency BBDO, they launched the campaign, “Coffee values and values”, which helped to propel them back towards success. Within this campaign, they used lines such as “If your coffee isn’t perfect, we’ll make it over. If it’s still not perfect, you must not be in a Starbucks”. Confident but sassy. The result? Starbucks showcased their brand as one that’s focused on providing quality coffee, which resulted in $16 billion revenue in 2014. As the world’s biggest player in comic books, Marvel is home to a number of iconic characters, including Captain America and Spider-Man. But when the comics market crashed in the mid-90’s, Marvel was left broke and could do nothing to save themselves from bankruptcy. But if a company that’s responsible for some of the most awe-inspiring superheroes gave up without a fight, what hope is there for the rest of us? In 1999, Peter Cuneo became CEO of Marvel and introduced Isaac Perlmutter to the company. They adopted a licensing model for all of their different forms of media, including television shows and movies. This enabled them to cut back on their capital and conserve cash. But in order to make the company grow they realized that they needed to make sure they didn’t just appeal to comic book fans (we don’t need to describe what these guys look like, do we?) but appealed to the general public as a whole. The result? They focused on movies, creating X-Men, Spider-Man, the Avengers and Iron Man, which are all being billion-dollar franchises today. No article about brand resurrections would be complete without mentioning Apple Inc. as many hail this as the greatest comeback of them all. Apple enjoyed their early success during the late 70’s and early 80’s, creating the likes of the Apple II and Apple III computers. But when co-founder Steve Jobs was fired in 1985 due to creative differences, things started to fall apart for the brand with many believing there were no more bites left of this apple. However, in 1997 Jobs was reintroduced to the company and he brought with him some revolutionary ideas that turned the company around. He cavorted (quite unashamedly, we might add) with their biggest rival, Microsoft, taking a cash infusion of $150 million in order to get the rights to ship Internet Explorer and Microsoft Office on the Macintosh. He also looked at other avenues that ventured away from the traditional Mac, focusing on iPhones and iPods and he started opening more Apple stores, making sure his products were in front of everyone. The result? Apple is now worth $586 billion (as of May 2016) and enjoys a 40% share in the U.S. smartphone market. And who can imagine a world without iPhones and iPads? So, what can you learn from the amazing comebacks that these brands have enjoyed? Firstly, if you see something’s not working, you need to change it. Then you need to make sure you’re differentiating yourself from your competitors so you can bring a new twist to your customers. And finally, don’t be afraid to break the mold. Many of these organizations have resisted the norm to enjoy their branding resurrection.